I think I hate games. Not because I don’t like them, I’ve been playing games my whole life, and video games for longer than I remember at this point. I have a few moral objections to things in the gaming industry, but nothing that really makes me want to stop playing them forever. No, I think I hate games because I’m almost always destroying them. Recently, I played last year’s Tomb Raider reboot. In it, Lara massacres the population of an entire island, almost single handedly. She kills an animal or two as the plot demands it, but most of her time is spent slaughtering the hundreds of beardy goons who get in her way. This is a far cry from the original Tomb Raider, where Lara was more interested in climbing and jumping around ancient ruins than fighting the four human enemies she comes across. Of course, the shift can be explained by realizing that modern Tomb Raider is inspired by Uncharted, which is in turn inspired by classic Tomb Raider, but I digress. Take THAT, you beardy goon. Tomb Raider has always featured that sort of destructive relationship with the world. The title even admits that Lara is a thief, a Tomb Raider, and, like Indiana Jones, she’s a scrupulous hero at best. You might ask why a name matters, but when you look at the titles of our most popular games today, you start to get a picture of the problem. Call of Duty, Grand Theft Auto, Assassin’s Creed, all of them pretty squarely place your relationship with the world as an antagonistic one. You are a soldier, at war, a career criminal, an assassin. These are the fantasies we want to play out. We want to destroy. There’s nothing wrong with that, of course. People need release, power fantasies sell, and with good reason. It caters to our instinct to lash out, to get even with the world and work through our frustrations in a safe environment. It’s fun to crash a car into a pedestrian in Grand Theft Auto because you’ve been annoyed at pedestrians before. It’s fun to kill a cop because you get to thumb your nose at the authorities. You’re the underdog, using the game as a way to fight back . But there is a severe imbalance. Three beardy goons, one arrow, and a pocket full of napalm. What's a girl to do? Throughout my tenure as a person who plays video games, I’ve depopulated kingdoms, rendered entire races of mystical creatures extinct, and beaten the ever-loving crap about of Ken Masters like a thousand times. TAKE THAT, MASTERS. EAT MY DUMB PLASMA FIST. But I can count on one hand the games where I feel like my love for existing in the world was proportional to my having a positive relationship with it. Animal Crossing and Harvest Moon come to mind, sure, but even generally family-friendly Nintendo games like Mario and Zelda are about nothing but destroying the world and its inhabitants. The plot of the first two Metroids is literally Samus committing genocide. Seriously, Metroid II keeps track of how many Metroids you have left to kill until you've eradicated the species. It’s not hard to see where this destructive impetus comes from. Games tend to have a winner and a loser, and the distinction usually involves the winner triumphing in some way over the loser. Winning makes us feel good, especially when it means we beat someone else. In this case, that someone else is the computer, or in a more immediate sense, the game world. I’m not calling for an end to video game violence or something like that. Games have violence like movies have violence. The recent crusades against violent games are the same crusade waged against rap, cartoons, movies and rock and roll. And personally, I sort of like violent games. Not always, and not senselessly violent games, but I’m not above playing Saint’s Row and kicking someone so hard in the balls they fly across the street. I’m not above feeling satisfied that I got a really clean headshot in Uncharted. I’m not above feeling that adrenaline rush that comes when you’ve accomplished something challenging, even if it involves killing a few dozen fictional dudes. Because they’re just that: fictional. Games come from a tradition of winning and losing, but their key strength over board, card or playground games is showing you your moment to moment progress. A video game can always make you feel like you’re getting better. The easiest way to do that is have you complete multiple tasks, or in the now-common gaming parlance, “beat them”. You beat a game, you rarely finish it, and you never end it. You beat it. You assert dominance over it by completing every task it asks you to accomplish. The simplest task for someone to understand is defeating someone else with similar tools. Think about football. The core actions you do in a game of football are easy to understand because they’re just basic actions. Throwing, catching, kicking. You’ve known how to do those things since you were a baby. Video games on the other hand require you to press certain buttons and move sticks around to manipulate a 2D or 3D plane. It’s hard enough wrapping your brain around the actions necessary to make your on-screen avatar do anything at all, let alone trying to explain some asinine set of rules you’ve layered over those actions. Imagine if football never existed as a sport, and only as a video game. A newcomer would have to not only figure out how to control the game and manipulate it as a player, but also figure out its many, many rules on top of that. It’s hard, and would make people stop playing pretty quickly- the last thing any developer wants. So, our games give us tools, explain how to use them, and then ask us to beat someone up. That person is hurting you, use your tools to hurt them more. Use your tools in conjunction, develop strategies, but make sure you kill them before they kill you. It’s easy to understand, caters to our natural instincts, and best of all, it’s fun. I am the cowlord, bow before your moo-ster. I love Harvest Moon, but it is an incredibly complicated game for being “just” about farming. Chulip, a game about love, suffers because its goals are poorly communicated and abstract. Visual novels and dating sims are derided because all you do is read. You can’t win. In order to make a complex goal, you need to simplify the game, which doesn’t sell. In order to have a complex enough game, you need to simplify the goal, which makes it easier to lean on destruction, because that does sell. Love is complicated, love is hard, we’ve always known that. Which is why hate sells so well. We want to feel powerful, and it’s easy to feel powerful when you’re constantly proving yourself superior to everything else in the world. Eventually you become the most powerful thing in the world. Destructive power fantasy is easy. And though it’s hard for me to say it, I like it sometimes too. It’s fun to feel powerful. To be fair, I can see how this might actually be a little destructive. But it's for the good of mankind! But, It’s also fun to feel like I’m making a positive contribution to the world. It’s fun to feel like I’ve made people’s lives better in the Ace Attorney games, or changed the world a little bit in Harvest Moon, all without hurting anyone or destroying anything. 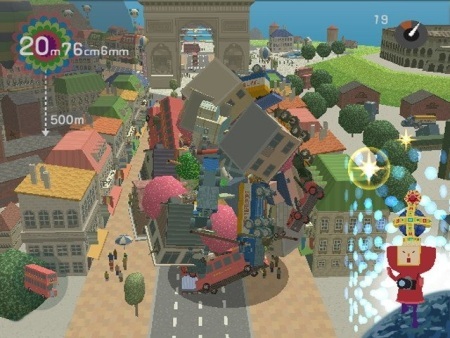 Even destructive games that aren’t about violence, like Katamari Damacy or Portal are rare creatures these days. After finishing Tomb Raider last month, I decided that I wasn’t going to play another game this year where I was doing nothing but shooting people. It’s a small gesture. I’m still going to end up playing things where I have a negative impact on the world, or primarily interact with things though violence, but I want to put down the guns at least Just as a symbolic move. I want more Harvest Moons, more Ace Attorneys, more Catherines. I don’t want to want to have to hurt a single digital soul to get them. Posted in Op-Ed, Features, Why Love?